Manchester United kept up their their winning ways after securing a difficult 1-0 win at Burnley thanks to another very good goal from Anthony Martial. Contributing writer, Nathan Quao, of Citi Sports, Accra, Ghana, notes some of the major talking points. For a match that was certain to be tough, the Man United looked flat for long periods and it was essentially Burnley’s lack of proper firepower in attack that hampered the home side from getting from the tie. The Red Devils had an air of tiredness for most parts of the game while they should have been crisper and sharper. Whenever the ball was turned over, players like Ashley Young had obvious challenges racing back to take care of the potential danger and it could have been very dangerous. Finally, when the lights came on and there was some life in the team, sustaining the grip was tough to do. Passes would be exchanged but the final phase was absent. Credit, though must be given, for the work that went into the goal but it could have and probably should have been more. The next Premier League game is at Tottenham and such poor starts and a lack of urgency will be punished. Spurs are very capable of causing problems. The pair of Chris Smalling and Phil Jones does not leave fans too happy but while their team mates were struggling to keep up with the war in midfield, the two players held their own and did their very best to thwart Burnley. Smalling and Jones headed everything that came their way and they willing to step out of their zone to give their bit to the cause. Jones had a moment in the second half when he took a pass and went on a forward run just to give some life and a different dynamic to the attack. 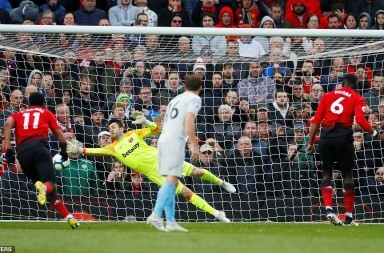 Smalling was fouled at a point late in the second half for a free kick. One may wonder why that was significant. The value of the decision to move and get fouled gave the team a chance to breathe a little as Burnley upped the ante in search of the equaliser. Jones was named Man of the Match and it was deserved. His work together with that of Smalling’s was the backbone for the victory and that will please the manager. After all, defensive solidity is what tickles his fancy. With all the talk surrounding the entrance of Alexis Sanchez, it will be prudent for the other players in the forward positions to show their value to the team. One such player is Marcus Rashford and his role in the match at Burnley was certainly to provide an outlet for the counter attack. But his display, not matter how brief it was, did not please onlookers especially he had the chance to mostly create goals for his colleagues. There was a moment when Lukaku was free in the box and was waiting for the pass from Rashford. That did not happen. The Belgian was the most obvious option and yet, he did not receive the pass. One cannot tell if he was in an offside position or not but it was very clear that Rashford had other ideas than an assist. Granted, Sanchez’s place in the team will cause a shift and bring competition. However, if Marcus Rashford will thrive, he needs to make statements. Those who make goals also get credit and he must see that. He will get his goals, surely but he should not be eager to make himself a villain. The regular price for such decisions is very costly. Sir Alex won everything a few times.bought quality and sometimes didn’t.But he won everything.Saw through Raiola from the get go. When Jose’s United win a Premiership and a Champions league I’ll be quite. And I think he may win Champions league before the League. Sir Alex bought Rio for big money agreed but the man was Pricless a legend. How many legends are on this team?DeGea Valencia perhaps both Sir Alex’s buys. claiming that he didnt miss those plaers is absurd. Silva and Aguero are still crucial for city and look for how long and now we got Sanchez 4 years later. Yaya would have been a beast and still playing for us just like Carrick. they would have all come play for us in a second. just pay what is needed and bring them in. but the past is the past, just dont say we didnt miss on them. Quite a point you've made there mate.. never thought of that to be honest.. Bailly and Pogba have the talent and potential to become legends (I'm talking only Jose's signings here).. Mkhitaryan flopped and Zlatan and Matic came too late..
That's the point.. like you say we had THE manager of all time and we had absolutely no need for any of them.. the man could win a league with average players! Plus I think SAF was a man who stuck to his principles and he never payed a penny over what he deemed acceptable.. city at that time just came into all of that money and decided to over pay clubs and players..
SAF probably took a look and said, why bother paying that much when I can show the entire world I can win with much less.. It's like pep.. 95% of people are saying it's easy for any manager to spend millions and build a top team and win trophies.. what makes you special is when you can do what others can't.. If Moyes, LVG or Jose missed out on them players then we can say the club missed out.. Ask yourself this.. would you rather have Moyes/LVG/José with Aguero, Silva and Toure.. or SAF with Young, Owen, Obertan..
Sir Alex passed on a lot of players because of either high transfer fees or player demands,him and Gill would work out what they thought was a fair number and that was that.To this day he says the Glazers never refused him anything he just wasn't a check book manager. The last title most people considered was one of Sir Alex's weakest squads and wasn't given much chance to win but ended up winning by 11 pts. SAF was a different kind of animal and should have gone for those players, they were pretty cheap too even for that moment. we missed on them. it's simple for me since you can clearly see their influence in the league. The idea is that we should have gotten improved. SAF didnt buy a midfielder for what 5-8 years? as for that last question, i don't get that. what i can say is. i'd rather we had SAF at that time with Aguero Silva and Toure cause that's the most realistic. SAF brought us RVP and we won by 11.
if he brought in Aguero SIlva and Yaya. we would be winning it by 20. that's my point. he could have made us stronger and probably get us another European trophy. I think we should go next for Crouchinho? Yes I think we should. He came out with one of my favourite comments though . He was asked "What would you be if you weren't a famous footballer ? " Haha Hendrix.. I remember that.. was a brilliant one..
Internet a little slow where I am.. mind posting main parts? Would you say Rashford is unproven?" As the main and sole striker throughout the whole of a season I would, yes. But I want to see him in a front two or three. "Mobi, CR, WAU, Bryan etc..
Lukaku will start as striker > 90% of the time. Once we fix the other problems, he will become even more prolific." I don't doubt that he will score more goals with better service. I think there are still some question marks over his technique, hold-up play and dynamism though. Going forward we will be able to better assess it. "The next big thing for us to be top 5 team in quality in Europe, should be an 8 or a 10. An 8 for sure. Don't see a big need for a 10 at all right now, with Lingard, Sánchez and Mata all being able to fill that role. Though for me I hope Herrera starts getting a bit more playing time. Think he just had a loss of form earlier. *I want to see him (Rashford) *centrally* in a front two or three.